Additional Info: My name is Ryan LeGrand and I am the owner and operator of LeGrand Piano Tuning, a Certified Piano Technician, and a Thumbtack Top Pro. Everything we do is to inspire your music. We don't just tune, we service. When we care for your piano, we not only leave it in perfect tune, but we clean and make any necessary minor adjustments free of charge, to make your instrument an extension of your musical ideas. 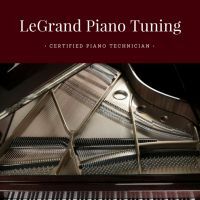 Ryan LeGrand, the owner and operator of LeGrand Piano Tuning, is a CPT (Certified Piano Technician) and is a graduate of the Piano Technicians Acadamy. Students in the academy spend over 250 hours studying the ins and outs of piano tuning, cleaning, regulation, and repair. When you book with us you can trust that your piano will be in expert hands. Driven by success and customer satisfaction, we understand the importance of going above and beyond for our customers whenever and wherever they need us. We always treat every piano we service as though it were our own, and treat it with the respect it deserves. And don't just take our word for it, look at the testimonials from satisfied clients! I love sharing the gift of music to others. It is very rewarding to work with a piano and make it where it is the best possible instrument it can be. There is something immensely satisfying when I sit down before a battered instrument and spend the time to nurture it back to life so it can be used to create art and music again. Fees: If your piano has been tuned fairly recently (last 12 months or so) it will likely require just the standard service appointment, which is $135. If the piano requires a pitch-raise tuning than that would be a little more expensive at $195. And of course, all of our service appointments also include cleaning, minor regulation work to optimize performance, and minor repairs all free of charge. I also offer cleaning services ranging from $50 - $150. Repair work, such as fixing sticking keys, is charged at an hourly rate of $75. I have three different options for piano regulation, ranging from $450 - $1,500 depending on the level. All these services, along with detailed descriptions can be found on my website.